Story By: Mike Flagg, aka "Mike MT"
E-mail: 6flaggs@in-tch.com Mike is a Holistic Healthcare Practitioner living, working...and fishing in Kalispell, Montana. For years I've heard about how effective a properly fished muddler can be, but I was never a big fan of them; they just didn't have the minnow look of a Clouser, Dace, etc. But this particular variation finally sold me on the muddler in a big way. One late September day I floated a river close to home. It's not a "blue ribbon" river by any stretch of the imagination, but it does harbor some very large rainbows, cutts, and the occasional bulltrout, all of which LOVE minnows in the fall. The drift winds it's way through some of the most pristine country I've ever seen. Grizzly and black bear, moose, elk, and whitetail deer frequent the corridor, and you can expect to see at least one of these fine creatures during any given day. Common, too, are 15’ – 20’ deep holes, log jams, crystal clear water, and a little manual labor dragging or carrying the boat through the shallows. Maybe that's the reason this area doesn't get much fishing pressure – there’s too much work. We put in the two-man pontoon boat and started our trip about three miles upstream from where we expected to finish, just as it began to rain. I tied on the Bloody Muddler first thing -- more out of curiosity than anything else. Would the red calftail underwing really make that big of a difference? 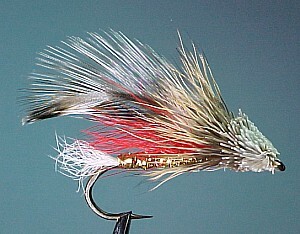 Red has always been good for cutthroat, and it did look like a wounded minnow...maybe it'll trigger a strike. At the first hole, 8' deep and near the far bank, I hooked a very respectable 19" rainbow. I've caught 19" 'bows before, but what made me take notice of this particular fish was that my fishing companion had just worked that hole thoroughly with his favorite fly for this river, an olive conehead woolly bugger, and he hadn’t had a single strike or nudge. That's the way the day went. Each time he’d work a hole with his buggers, I'd come behind with the Bloody Muddler and catch the fish. As the rain continued to fall, I continued to catch fish, and my buddy's frustration grew. Of the five flies I had tied, logjams had claimed all but one. I nevertheless offered him the last one, but as a true friend he declined and stayed with his buggers. About halfway through the float I lost that last fly and ended up fishing standard muddlers and buggers, with not so much as a strike during the remainder of the trip. I was sold on the Bloody Muddler. It outfished all other patterns that day, and put four very nice trout in my net. I will certainly be fishing this fly MUCH more in the future. Additional Tying Notes: I like a wing of grizzly hackle rather than the traditional turkey wing quill sections. The hackle holds it's shape better and has nice pawmark barrings. I personally don't weight the fly because it limits the options on how it can be fished. Without weight it can be fished shallow or even dry. To fish deep, I put a split shot on the tippet at the eye; the fish don't seem to mind. I make a sparser collar than what's usually found on a muddler because I feel a dense collar kills the action a bit. If there's one thing I've learned in 25 years of tying, it's that "less is more." There are so many ways to trim muddler heads, but on this one I like a sculpin type cut. How I Fish The Fly: I typically fish the Bloody Muddler as a streamer. Remember, it's intended to imitate a "wounded" minnow, so fish it as such. Takes are very aggressive so don't use less than 2x tippet (1x is better). Have fun and be prepared for bone jarring strikes. Fly Origin: I must give credit where credit is due. I did not design this pattern. I heard about it from a steelheader in Washington state, and as far as I know he (his name escapes me) developed it years ago.